Michael Cush has a vision, and it’s one shared by millions of low vision and blind individuals across the United States – to vastly increase the number of employers who understand that the vision impaired population can be gainfully employed and make significant contributions to the workforce. Cush is theSenior Director of Workforce Development for VISIONS/Services for the Blind and Visually Impaired. It’s a nonprofit vision rehabilitation and social service organization whose mission is to develop and implement programs that help blind or visually impaired people of all ages to lead independent lives. It is also to educate the public to “understand the capabilities and needs of people who are blind or visually impaired so that they may be integrated into all aspects of community life”. The numbers show their success. For the third year in a row, VISIONS is the number one agency in New York State for total job placements of legally blind New Yorkers. In 2018 alone, they helped over 7,000 people through their various programs. VISIONS works with a diverse, often traumatized population. Many of VISIONS clients have lost their vision late in life and are struggling with questions seminal to their livelihood. They include a cardiologist whose low vision preempted conducting surgery and a truck driver who could no longer see to drive. Their vision is robbed by diseases like retinitis pigmentosa and age-related macular degeneration, traumatic head injuries, or gunshot wounds. Although they are diverse, they all share the shock of losing all or part of their vision. Perhaps one of the most important services that VISIONS provides is helping people identify transferable skills in order to reimagine themselves. A cardiologist who can no longer perform surgery might believe that his or her career has come to end, when in fact there is an opportunity to teach or consult. Many with low vision don’t know that help is available. It’s estimated by the National Eye Institute that a meager three percent of those who need vision rehabilitation ever receive it. Some are struggling to work, holding their face two inches from a computer screen to see, and others think they can adapt to vision loss on their own. That’s why the organization does a lot of outreach through senior services, low vision doctors, and community events. It’s important to expand awareness that vision enhancements, adaptive devices, support and job placement services are available free of charge through VISIONS. To find placements for their clients, VISIONS works hand in hand with employers, educating them and partnering with them. “We want employers to understand that it is not difficult to employ those with vision impairment and that they can be highly productive employees,” Michael said. VISIONS works with a base of 40 to 50 employer partners in New York City and the surrounding area including Westchester, Rockland, Nassau, and Suffolk counties. VISIONS has built successful relationships and many job placements with these employers because they know that blind and low vision employees can work just as productively as those with full sight. Michael said many employers are surprised at how simple it is to accommodate those who are blind or have low vision. Most of the time it only requires that the low vision or blind employee have a a screen reader, a video magnifying device to enlarge the screen, a voice smart phone, or an easily downloadable software system. 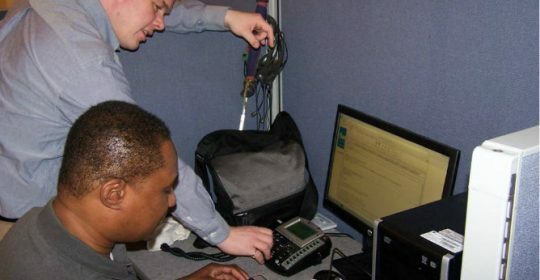 VISIONS will provide the software and training for both the employee and the employer, paid for by the New York State Commission for the Blind. VISIONS work is never done. They also work with babies born with cortical vision impairment, a condition that results in difficulty processing images from the surrounding environment. VISIONS works with parents of children with the condition to learn how to help their children at home with activities of daily living like getting dressed, washing hands and brushing teeth. VISIONS also has a youth coalition that provides outreach services to the New York City public school system and libraries. VISIONS provides home training nights and weekends, makes home adaptation recommendations and installs many adaptations, and provides vision rehabilitation therapists to train blind clients how to manage their home, child care, cooking and communications safely. All their services are provided in 10 different languages. It’s the work that began when six women founded VISIONS in 1926 to give blind World War I veterans a place to find training and support. Now, VISIONS has a built a residential vocational rehabilitation training center on a 37-acre campus north of New York City where they are expanding youth education. They are teaching blind young adults aged 18 to 22 to be independent and gain workforce skills like being a nursing assistant, vet assistant, web developer, customer service representative and more. Training is provided by VISIONS professional staff and the local community college and paid for by the NYS Commission for the Blind. Next, they will begin to work on weekends with 10 to 14-year-olds who are blind or living with low vision and give them the self-confidence, self-advocacy, and prevocational skills they need. “We want parents to become better educated on how to work with kids, let go, and let them be more independent. We are giving them the resources and tools for that to happen,” said Michael.